This is a traditional thangka* painting, which was especially commissioned by Tashi Mannox on the rarely depicted great calligrapher and scholar Thönmi Sambhota. 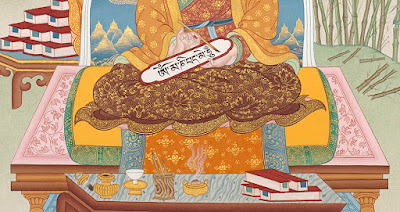 Sambhota is reputed to be a historical figure responsible for developing the foundation of the Tibetan writing systems in the seventh century A.D, which form the basis of the Tibetan language today. See below for the History of the Tibetan Writing System. In this thangka, Thönmi Sambhota is shown as the main figure wearing traditional attire of a Tibetan layperson, though wears a white turban in reference to his many years spent in Northern India studying chiefly Sanskrit with Brahmins and Pandits. 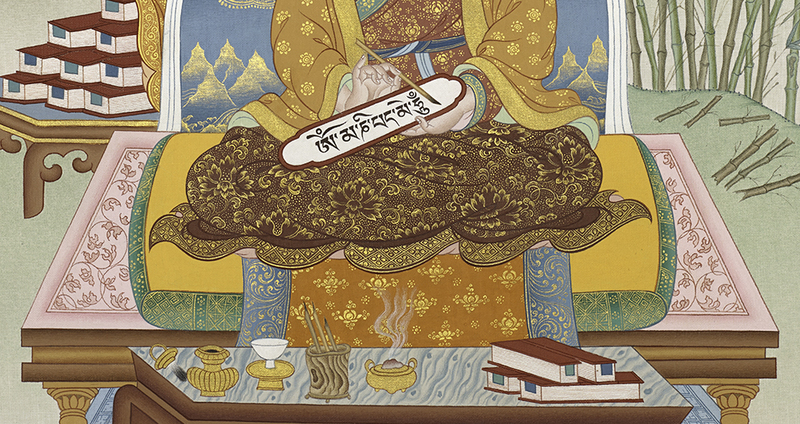 He holds in his lap a tablet inscribed with a rendition of a Mani mantra, oṃ maṇipadme hūṃ, which was presented to Dharmaraja King Songtsen Gampo as the first sample he created of the Tibetan Uchen script. The original writing of this mantra was carved on a rock in Rigsum Gompo temple in central Tibet, which was unfortunately destroyed during the Cultural Revolution. On a table before Sambhota are laid out calligraphy implements such as ink and bamboo pens, cut from the bamboo grove behind him. 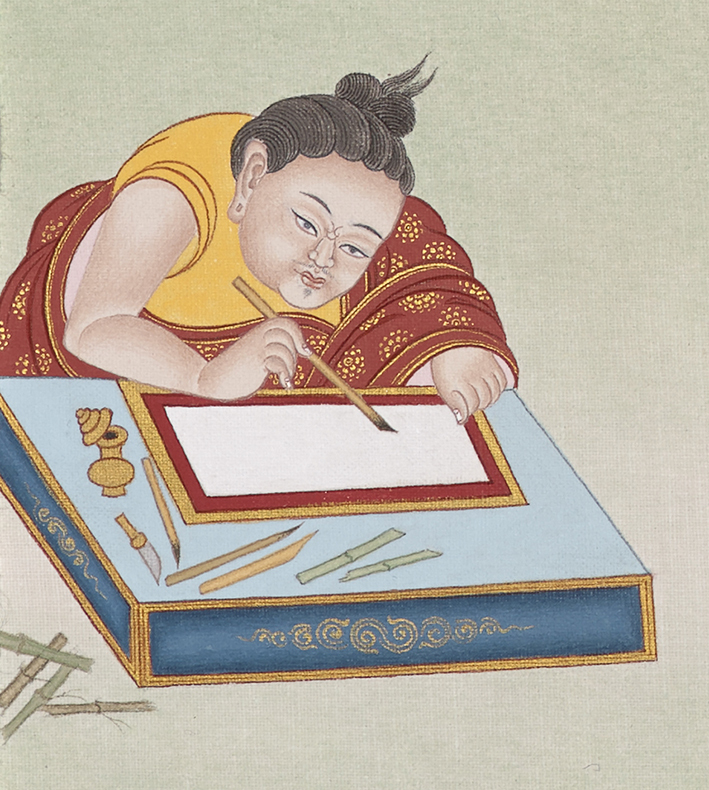 Tibetan manuscripts also sit before and behind referring to Sambhota’s scholarly achievements and the Tibetan grammar and punctuation he composed. 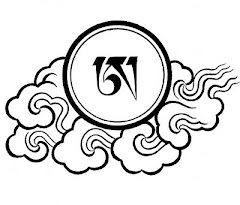 Emanating from Sambhota on rainbow beams are two golden disks marked with the letter Aa ཨ the last letter of the Tibetan alphabet, which is also considered the essence and expression of the entire alphabet in one. On the left is Aa ཨ in the classical Uchen script and on the right is the same letter Aa ཨ in the Umed class of scripts. These represent the two main groups of script styles he created and still in use to the present day. 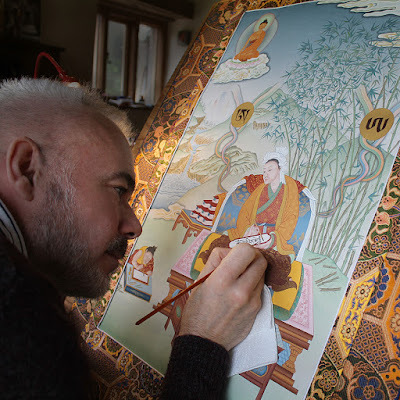 The thangka painter Sahil Bhopal entrusted Tashi to personally add the two principle letters Aa ཨ to the golden disks, as well as the Mani mantra within the thangka. To Sambhota’s below right is a student in practice of calligraphy. While above is a scene of nature, more typical of the Karma Gadri style of thangka painting, with trees and a cascading waterfall bringing prosperity. In the far distance are five mountains of Manjushri, the deity of learning, or can also represent the five Wisdom Buddha families. In the sky above is Sakymuni Buddha, who crowns Thönmi Sambhota representing his Buddhist belonging, and motivation to benefit all. This thangka is available at near life-size as a superb quality Geclée print. 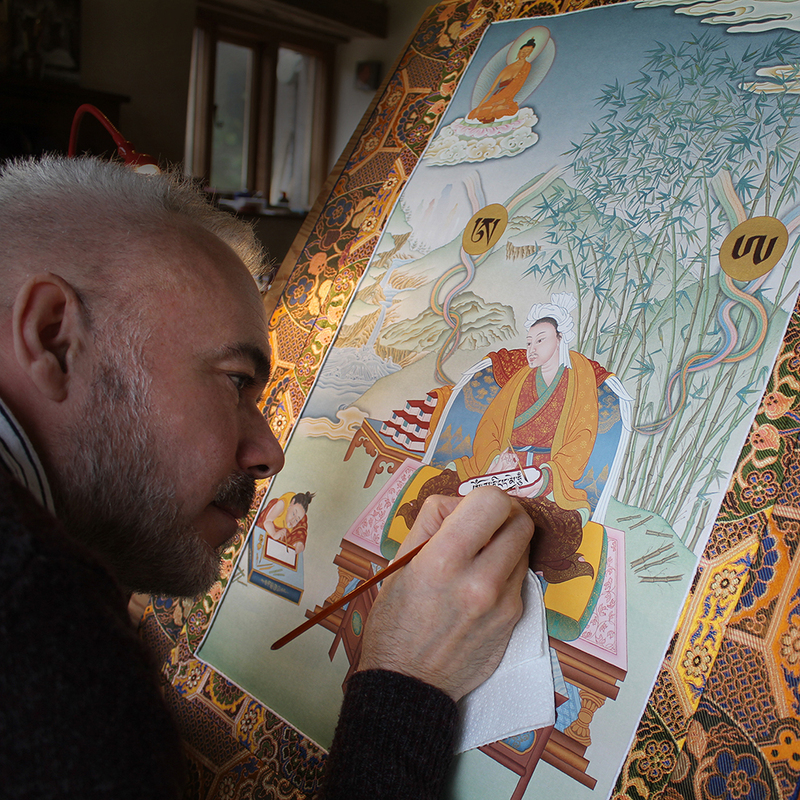 There is a choice of of base of two mediums of sustainably sourced natural white bamboo paper at 290 grm, or on matt printed on fine canvas, that is convincing to the effect of a real painted thangka. Canvas is also advantageous in that it can be sewn into a traditional brocade mount. To place an order for a Thönmi Sambhota thangka, please follow the link here. *Tibetan thangka painting is one of the great arts of Asia. A particular stylistic development of painting in natural mineral media, normally on cloth which is mounted in a brocade frame, designed to role up as a portable scroll. 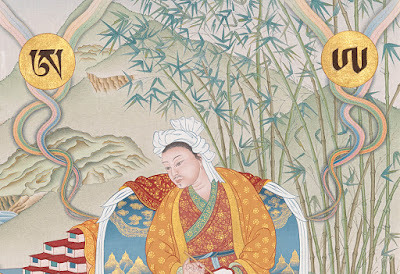 Thangkas are typically rich in iconography of their religious content that communicate the highest Buddhist ideals, often as a visual aid to be meditated upon or to depict historical figures and spiritual events. 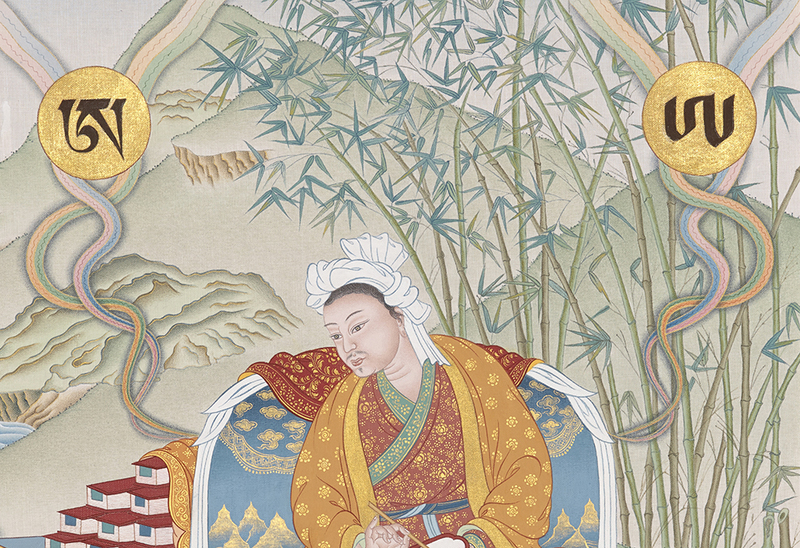 For a Tibetan Buddhist, thangkas are considered inspirational sacred paintings in their physical support to a practitioner as an embodiment of enlightenment. It was during the seventh century reign of Tibetan King Songtsen Gampo, and under his direction, that the first iteration of what would become the modern day Tibetan written language came into existence. Prior to this Tibetans had used Mayig, a comparatively rudimentary system. 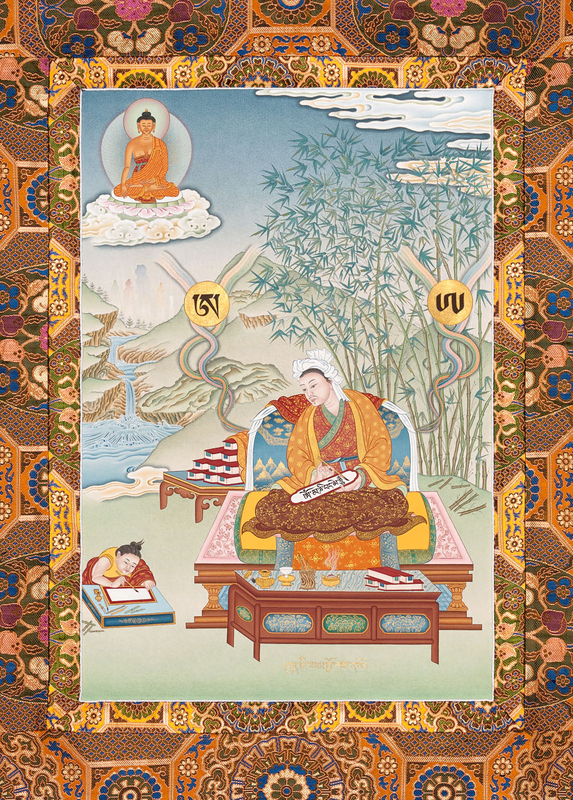 But Songtsen Gampo was faced with the task of translating the wealth of existing Buddhist Sanskrit texts into Tibetan, and needed a coherent writing system with sufficiently rich symbolism. He turned to minister and great scholar, Thönmi Sambhota, who along with sixteen other wise ministers travelled to India to study Sanskrit. Only Sambhota would return suitably qualified. His journey had proved fruitful, however, and a new Tibetan writing system, based loosely on Indic Sanskrit was established. It is worth noting that the Tibetan spoken language remained the same; only written language was renovated. 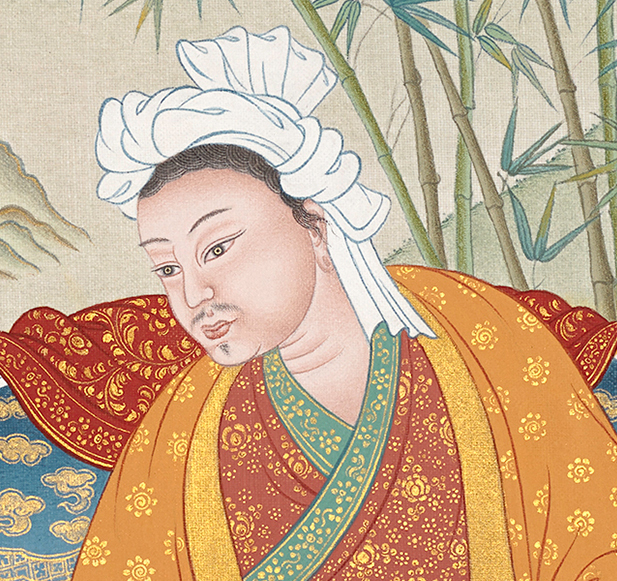 Sambhota had conceived an alphabet and standardised writing conventions, including grammar and punctuation, and would later also produce the first iteration of both the Uchen and Umed forms. Different script styles developed over the next several hundred years. In the early ninth century the Tibetan script underwent another transformation and ‘Old Tibetan’ was standardised to ‘Classical Tibetan’. 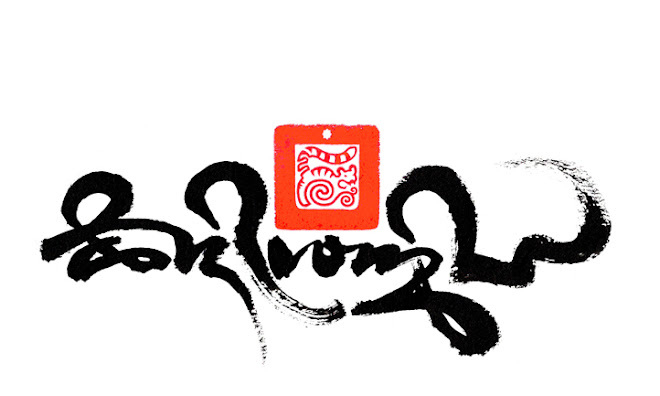 One thousand years passed, yet Tibetan calligraphy persevered, steadily evolving towards its contemporary form. By the nineteenth century the models of Uchen and Umed, the two main Tibetan script styles, had ossified and bore the exact proportions still in use today. From the offset, then, a notable bond existed between the Tibetan writing system and Buddhism – its creation being motivated primarily by a need to conserve and decipher Sanskrit Buddhist manuscripts. To limit calligraphy and Tibetan Buddhism (and by association Tibetan culture’s) connection to simply a functional conception, however, does not do justice to their relationship. The two are largely inseparable and have remained so to the present day. Tibetan Buddhism is considered a ‘live’ tradition, comprised of many lineages in which a master will impress the totality of a line’s knowledge on a disciple. The lineage is also considered fluid, as the disciple then realises the wisdom of these teachings through meditation. Clearly, the academic and meditative aspects of Tibetan Buddhism are closely linked. Calligraphy’s role in this relationship as a key by which existing Buddhist teachings are unlocked compounds its status. Developing a written language certainly also had administrational benefits for the empire, with its use in legal and historical documents.